Hello, everybody! So I got my computer back, finally! And everything seems to be okay. I've been very busy at work lately and overwhelmed with a lot of emotions. Oh, the life of a Pisces. I will have lots to post when I have free time. I was going to post about Coachella/summer festival fashion ideas. Anyways, I made the above collage of items I'm drooling over. This is my ultimate dream spring/summer wardrobe for this year. Mostly Matthew Williamson and D&G mixed with a healthy dose of Urban Outfitters. The leather jacket of perfection is by Diesel. And the whimsical ring is by Dior. So dreamy. A very good friend of mine is moving to the windy city. I am very sad but excited for her. She's an amazing person. So smart, cute, talented, with a great sense of humor. Perfect, right? I know. To top it all off, she really got me. As confusing and complicated as I may be, I knew in my heart that she just totally got me. Omg, I'm about to cry! 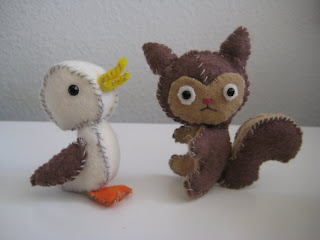 Well, I made these two critters for her. Aren't they cute? Very Michel Gondry (oh, how he inspires me). It is a bit sloppy because I made it in a hurry in time for her farewell dinner. I can't take all the credit. I downloaded the patterns online at puchicollective.com. You can make it too!